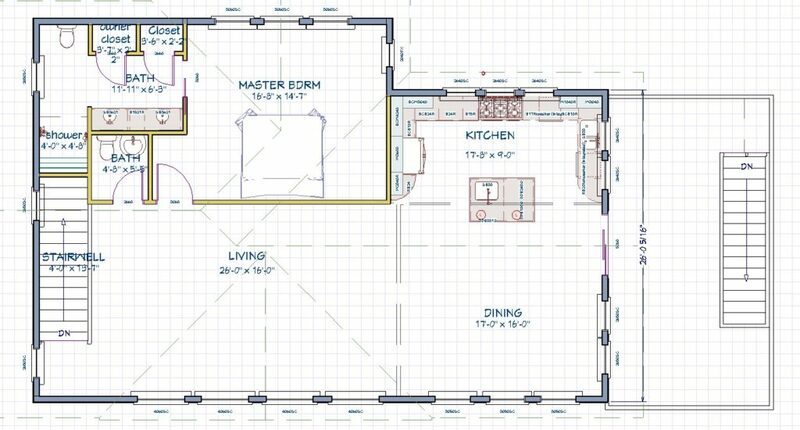 You are here: Home / Building a Beach House / Drawing Up Plans! Last week we submitted plans for the Owlhaven vacation house to the architect, a very thrilling development indeed!! Most likely he won’t have them back to us til late May, but of course I can’t help but hope it will be sooner. On our vacation to the coast over spring break, we made time to meet with a couple of different contractors, as we are trying to decide who to employ. Since we did contract our own home in Idaho years ago, we have tossed around the idea of contracting this house ourselves too. But we feel that building long-distance would be stressful, and difficult. I have been tweaking my version of the plans for so very long that now that I’ve sent them away, I am having to sit on my hands to STOP.THE.TWEAKING already. Here’s the current plan for the upstairs.We’ll see how many things the architect finds it necessary to change. Hopefully not the main public space, because I love the way the rooms flow together. I think it will be lovely and spacious. Currently there’s one en suite bedroom upstairs, and two more en suites downstairs, plus a couple of other sleep spaces, and also — bunk beds! More on that idea soon– it is gonna be so much fun for little children! Altogether the house will easily sleep 16 in beds, not counting cots/portacribs for kiddos ages 2 and under so they can tuck in and sleep near parents as needed. I’m thrilled that we were able to fit in three en-suite bedrooms, all with king beds, since that makes it comfortable for several different families to share the cost of the house. No trouble here with trying to decide who gets the master suite! The upstairs bedroom will also be handicap accessible, and we’ll install a stair chair so that people with mobility issues will have full access to the house. Another addition we recently decided on is a hot tub. Our inclination had been to not include one, just for reasons of simplified upkeep. But we’ve been told that many people consider a hot tub on the must-have list when vacationing. And truthfully, on our most recent trip to the coast, several members of our party greatly enjoyed the one at the home we rented. So it’s now on our must-have list too! So exciting! I will keep you posted as plans continue to develop.